Sutton’s Place – Last Summer, few real estate experts believed paying $9,100 per square foot for a stocky two-story building was worth the risk. This year, nobody’s second guessing Jeff Sutton. 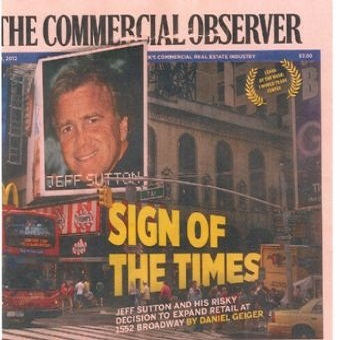 Before Jeff Sutton and SL Green formed a partnership to acquire 1552 Broadway last summer, the diminutive landmark was best known for the four female Broadway stars on its façade. Theatre buffs trolling the neighborhood often visited the two-story building for the stone figurines of Ethel Barrymore, Marilyn Miller, Rosa Ponselle and Mary Pickford mounted on its second level in the 1920s. But with a T.G.I. Friday’s restaurant as its tenant, the building had otherwise become virtually indistinguishable from the bonanza of bi-ticket retailers that have come to dominate Time Square. Nonetheless, SL Green and Mr. Sutton, widely considered one of the city’s most savvy retail investors, saw greater potential for the 15,000-square-foot asset-a fact indicated by the price they agreed to pay its owner, the Riese Organization. Indeed, at more than $136.5 million, the sale last year amounted to a shocking $9,100 per square foot, analysts and real estate executives told The Commercial Observer. But because ground floor retail in the city is vastly more valuable than below grade or mezzanine levels, Mr. Sutton and SL Green could be said to have essentially paid well over $100 million for 7,500 square feet, a price that works out to a phenomenal $18,200 per square foot-dizzyingly higher than the $1,000 per square foot figure top-quality office buildings trade for, real estate insiders acknowledged. “If Times Square is a 10-chapter book, we’re on chapter four right now,” said Patrick Smith, a retail executive and principal with the firm SRS Real Estate Partners who has followed the neighborhood’s evolution. “There’s no place that has more eyes on it and more consistent footsteps and TV coverage.